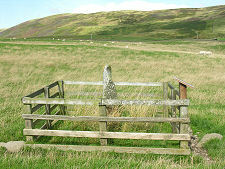 The Yarrow Stone, also sometimes known as the Liberalis Stone, stands in a wooden enclosure beside the track leading to Whitefield which leaves the north side of the A708 just over half a mile west of the tiny settlement of Yarrow and nearly nine miles west of Selkirk. 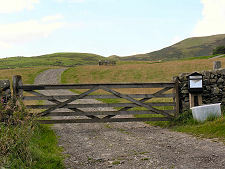 There is space to park without causing an obstruction beside the main road, and access is through a gate and along the track. What you find is, in Scottish terms, a highly unusual stone carrying an early Christian inscription in Latin commemorating two British princes who lived and died in the 400s or 500s. 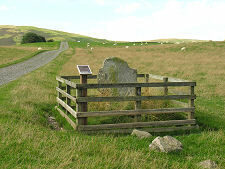 At that time this area would have been under the control of the British Kingdom of Strathclyde, a kingdom extinguished almost without trace centuries later and which culturally and linguistically had more in common with Wales than with any part of modern Scotland. 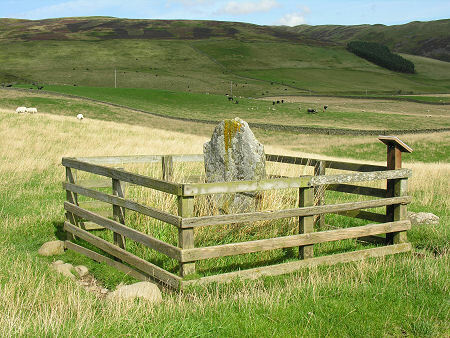 The stone was discovered, lying flat, when an area of moorland known as Annan Street was first ploughed for cultivation in 1803: beneath it were human bones. At the time there were 20 cairns standing in the surrounding area. The stone was taken for safe keeping to the Duke of Buccleuch's home at Bowhill House before later being erected in the location it was originally found. 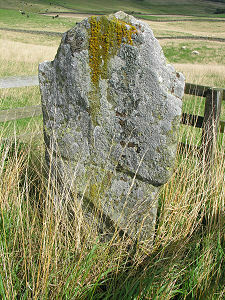 The stone is just under 1.5m high by 82cm wide by 35cm thick. The most striking feature is the inscription on what is now its east face in capitalised Latin. 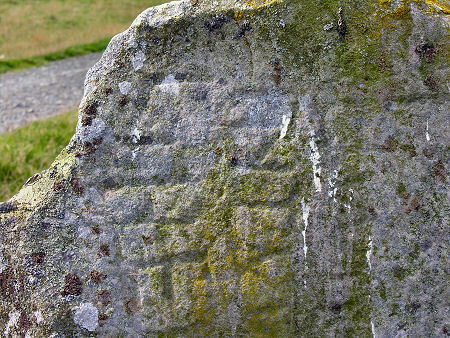 This has been badly weathered in places and seems to have been carved by a less than expert mason, but appears to read: "This is the everlasting memorial. In this place lie the most famous princes Nudoss and Dumnogenus. In this tomb lie the two sons of Liberalis." 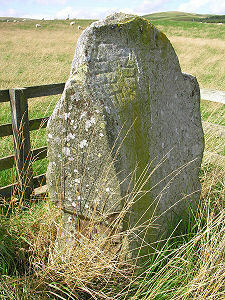 The overall shape of the stone, and the fact that the inscription runs sideways down it in six lines of text, tends to suggest that when originally erected, the memorial would have stood on its long side, with the text readable the right way up. This is consistent with the idea of a headstone intended to mark two graves placed side by side, and this in turn leads to the thought that when the stone was re-erected here in the early 1800s it was wrongly placed vertically. Having said that, we have been told that there was a tradition for inscriptions at this time to be written sideways: so perhaps the re-erectors got it right and we've been wrong for jumping to conclusions.